As we say goodbye (at least for the time being) to one veteran catcher, we can say congrats to another veteran catcher who is currently on a low-key farewell tour. David Ross, who was drafted by the Dodgers in 1998 and remained within the franchise for eight years (including 2+ seasons in Los Angeles), plays for the visiting Cubs and will be retiring after a fifteen year Major League career at the end of this season. Zarraga, who is making his first-career appearance on a big-league roster, batted a combined .265 (30-for-113) with a .348 on-base percentage, seven doubles and 14 RBI in 41 games with the OKC Dodgers and Double-A Tulsa this season. In nine minor league seasons, the switch-hitting backstop hit .282 with a .371 on-base percentage, 84 doubles, 14 home runs and 199 RBI. 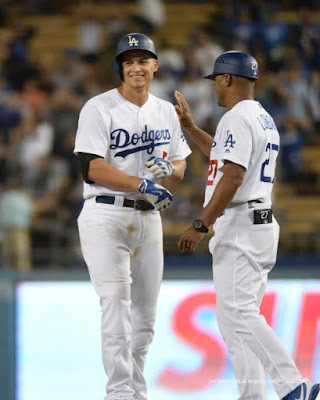 The 27-year-old Aruba native was acquired by the Dodgers in a trade with the Brewers on December 17, 2014 and was originally selected by Milwaukee in the 44th round in 2007 First-Year Player Draft out of Trinity Christian Academy in Lake Worth, Florida.